Looking for a new way to drive more revenue to your operation? Consider renting out the farm or the barn with short term farmstays. Oh, but to dream. 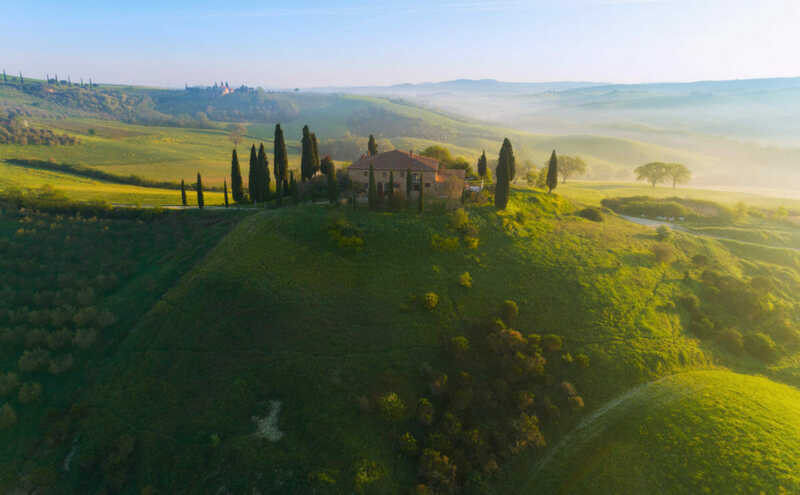 This hilltop farmhouse in Tuscany would be a winner on Airbnb. It’s no secret: The sharing economy is hot, and not just among urban dwellers renting a pied-a-terre for supplemental income. According to Airbnb’s “Beyond cities” report – which details the company’s growth in rural areas – the number of active hosts outside urban boundaries has increased 1,800 percent in the United States since 2012. In every state, the report says, the typical rural host earned from five to – get this – 20 percent of their overall household income by listing on the site, and cumulatively earned $495 million in the year spanning February 2016 to February 2017. In some states, short-term rentals even outnumber hotel rooms. Now farmers who have renovated outbuildings, spare rooms or a slice of land under the stars for pitching tents, are getting in on the action. Airbnb is the largest network, with more than four million listings in 191 countries. You can list single rooms, along with whole homes, and you can stay on-site with your guests if you want. It’s free to create a listing, then the site charges a pay-per-booking fee of 3 percent. HomeAway’s point of difference is that visitors don’t share; they rent an entire home and the host doesn’t stick around. It’s free to create a listing, and you can opt for a $499 annual subscription (recommended for year-round hosts) or pay-per-booking fee, which charges 5 percent commission, 3 percent credit card processing fee and 2 percent international surcharge (if it applies). On Hipcamp, no home is required; at minimum, you provide a stretch of land for tent camping. It’s free to create a listing, and the site charges a gross booking fee of 10 percent. The legal restrictions on short-term home rentals vary widely from city to county to state, and in some rare places, renting in this manner is outright illegal. So, get friendly with your city or town’s zoning board or local housing authority. In many municipalities, expect to be required to register your rental, and get a permit or rental license before listing your property. Each site’s help section is incredibly helpful, and the Airbnb website specifically has a summary of legal requirements for various cities. Remember, when you post, you agree to respective site’s terms and conditions, which means you’re the responsible one if you didn’t follow your local laws and regulations. Also, regulations get even trickier if you rent, and in some cases, you could be evicted. It’s best to stay above board, be knowledgeable about your lease, and level with your landlord. What happens if someone gets hurt on your property? All three sites provide $1 million liability insurance at no additional cost. Each site’s pricing structure differs slightly, but the best rule of the thumb is to search for comparable listings in your area, with similar amenities. Hipcamp, for instance, requires you set a base price that accounts for three people, and then tack on an additional fee for each person above and beyond that. Don’t forget to include the optional add-ons: cleaning fee, late check-in fee, pet fee, or bike rental fee are all fair game, but you must disclose them in the listing. After that, it’s up to you. As a farmer, you’ve immediately got a leg up on traditional listings in terms of unique offerings. Some hosts offer perks like fresh eggs for breakfast, yoga classes (even goat yoga!) u-pick fruit, horseback riding, produce for purchase, and even weddings and photo shoots. Working wineries offer tastings and cheese boards. If you’re comfortable and they’re game, let your guests help with chores. Patricia ZumBerge, owner of Misty Meadows Farmstead in Little Falls, Minnesota, rents the home on her 80-acre farm on HomeAway. She was blown away by the demand (she had bookings nearly immediately after going live) and by how many guests wanted to help feed chickens or horses, and even bale hay. Though mostly, she’s found that folks want to experience farm life away from technology, internet, and TV. “There’s a need for it,” ZumBerge says. “People are chomping at the bits to come to the farm and experience that lifestyle. It’s going to be so much more popular than you anticipate. Take great photos. Hipcamp allows you to request a Field Scout visit your land, who will shoot and verify your listing in exchange for one free night. The company claims sites that have Field Scout pictures earn on average five times more than those who don’t. Airbnb offers a similar service, and the cost is deducted from your next scheduled payout. Guests = instant new customers. ZumBerge was pleasantly surprised to see the family’s beef business increase after listing on HomeAway. “They understand how well the animals are taken care of, and now they’re interested in purchasing meat directly from us,” she says, along with produce and canned goods. Perhaps the best perk? The knowledge that you’re educating more people about how a working farm ticks, which is, “a happy byproduct [of the site],” says Alyssa Ravasio, CEO of Hipcamp. “We believe agriculture is at the core of the current environmental crisis and central to how people connect with rest of nature. And finally, don’t worry too much about making everything perfect. “People are seeking simple,” ZumBerge advises. “Think about all the amazing things that you enjoy on your farm every day and sell that, because that’s what drew you to farming, and that’s what society is craving: A connection to earth. A desire to be grounded. Seriously don’t fret. Their lives are full of fret that they have come to shed.